These bars are chewy and delicious, but not too sweet. They can easily be made gluten-free and/or dairy-free to suit your needs. Place oats on an ungreased 11″ x 17″ baking sheet and toast in oven for 10 minutes, stirring every 3-4 minutes. Meanwhile, melt honey and oil or butter together in a medium saucepan over medium heat, being careful not to burn it. Remove pan from heat; and add vanilla, salt and cinnamon. Stir until dissolved. Add toasted oats to the saucepan mixture and toss to coat. Add chopped almonds and stir. Add cocoa nibs (optional) and stir to combine. Transfer batter to this cookie sheet and gently spread to all edges. Once entire sheet is covered, press batter firmly into pan – I use a Ziplock sandwich bag on my hand for this step, but a sheet of parchment or wax paper should work well, too. Bake 8-10 minutes at 350 degrees. The bars are done when they just begin to turn brown at the edges. Don’t wait too long or they may burn! Bars will be moist and crumbly when removed from oven, but they come together as they cool! It may take a few attempts for you to figure out the best amount of time in your own oven. Let cool completely (about 90 minutes on a cooling rack; longer if you don’t have a cooling rack). Cut into 24 bars and remove from pan. Enjoy! We like our bars a little firmer and sweeter, so we store them in the fridge. They also freeze well for later use…and can be eaten frozen, as well! 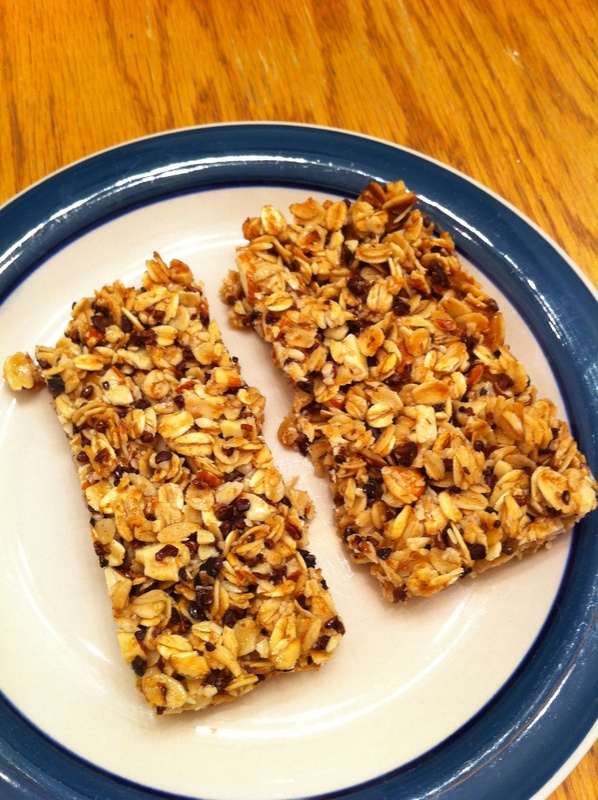 This entry was posted in Recipes and tagged almonds, bar, breakfast, chewy, chips, chocolate, desser, granola, healthy, honey, oats, portable, raw, recipe, snack. Bookmark the permalink. ← “City Girl” Meets Dairy Cow! Here is a granola recipe that I adapt to meet my tolerated foods. I cannot consume most of the granola brands available in stores nor prepare most granola recipes due to ingredient(s) that my body does not like. I have adapted the original recipe to suit my taste buds and digestion. Because I increased to amount of liquid in step 3a, I am still adjusting the oven temperature and baking time for a drier mixture. 1. Adjust oven rack to middle position. Preheat oven to 250 degrees F.
3. Add the following Ingredients in a saucepan. a. 1/3 cup maple syrup, honey, molasses, and/or Agave Nectar. d. 1 Tbs. water and or tasty adult liquor of choice. 4. Simmer wet ingredients over low heat for 5 minutes to dissolve the dry ingredients. 5. Drizzle wet ingredients over oat mixture. Stir to combine. 6. Pour mixture onto a cookie sheet prepared with parchment paper. 7. Spread the granola evenly onto the cookie sheet. 8. After placing granola/cookie sheet into oven, turn oven temp down to 250 degrees. Bake for 1 hour. 11. Allow to cool in the oven. 12. I add dry fruit and/or chocolate chips as I consume. Those looks amazing! Bookmarking this recipe for later! I bet they’d be great with fruit in them, too!